Oil-free scroll vacuum pumps in analytical instruments industry applications - Vacuum Pump - EVP Vacuum Solution! In recent years, domestic and foreign manufacturers have spectrometer will be incorporated into the oil-free scroll vacuum pump products popular attention in the mass spectrometer. Mass spectrometer is used to measure and analyze the gas composition, are industrial and academic research and development tools necessary equipment. Mass spectrometer according to the different material components, which gas ion mass and the charge on different principles, these under vacuum gas ionization, to determine the chemical composition of substances. To achieve this, the mass spectrometer must ensure that when the ion generating time (this occurs in the ionization chamber at the beginning of the process), which are capable of ionization and analysis of indoor air to roam freely without colliding molecules. Hence the need for a (group) to ensure vacuum ionization chamber and analysis of indoor air molecules do not exist. In order to make an accurate analysis of the results, but also the use of oil-free vacuum pump oil molecules are present to ensure that no interference on the analysis results. There are pharmaceutical companies users, they need to use bio-mass spectrometer analysis of the drug to be identified in order to conduct clinical trials. Oil-free scroll vacuum pump ensures high-precision measurements, which for pharmaceutical companies and research institutions are essential, through the use of China oil-free scroll vacuum pump, eliminating the interference of oil pollution. There are other users, such as in the steel industry, is also very sensitive to oil pollution, oil-free vacuum of the mass spectrometer is an inevitable choice. 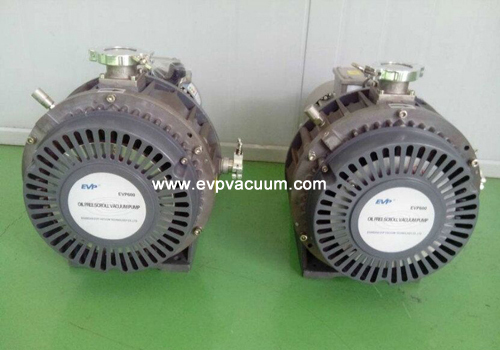 Over the past decade oil-free scroll vacuum pump has been successfully used in the semiconductor industry, and in energy, medical, automotive, environmental, instrumentation industry more and more common. Users increasingly trust oil-free scroll vacuum pump and the reasons are clear, its reliable, durable, easy to maintain, reduce operating costs and significantly improve the quality of manufactured products, etc., to give users a huge advantage. Generally in the 12-18 month payback, so users do not need to cut investment can improve the process, improve product quality, and create higher returns.